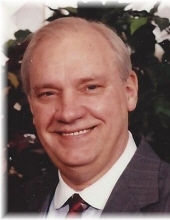 Celebrating the life of James H Johnson, Jr.
Obituary for James H Johnson, Jr.
James H. Johnson, Jr., 81, of Chillicothe and formerly of Henry, passed away Saturday April 13, 2019, 5:24 am at Evergreen Senior Living, Chillicothe. Calvert & Johnson Memorial Home, Henry is in charge of arrangements. Jim was born January 2, 1938 in Springhill Township, Pennsylvania to James H. Johnson, Sr and Lena M (Fraley) Johnson. He married Dorothy C. Mekley on November 23, 1960 in Everett, Washington. She preceded him in death on December 30, 2008. Surviving are his children, Mark A. Johnson, of Lewistown and Terri J. (Phil) Yordy, of Rochelle, one granddaughter, Morgan L. Yordy and one sister, Brenda J. (Thomas) Shipman, of Quantico, Maryland. His parents, one sister, Barbara H.“Bobbie” Johnson, preceded him in death. Jim graduated from Point Marion High School, Class of 1956. He enjoyed his school years fondly sharing memories, including participation in school plays, playing several sports, attending “cutting a rug” at dances, and many fun times with friends. After high school, He served in the United States Army Reserves, then into the United States Air Force from 1960 to 1964. He was employed at BF Goodrich in 1964 until his retirement on Feb 23, 2001. Jim was a very community minded person. He served on the Henry Zoning Board, volunteered on the ambulance service, was active in the Golden Hammer Award program and the New Comers Committee, and was very active in the Henry Jaycee’s. He was an avid golfer, and enjoyed playing on several local courses with Edgewood in McNabb being his favorite. For those who ever golfed with JJ knew he was competitive on the course. However, he also enjoyed sharing observations and techniques he felt may improve the other person’s game sitting in the cart right beside him. For those who continue to enjoy the game today, play a round of golf and enjoy an “Arnold Palmer” at the club house after in remembrance of Jim. The family would like to extend a very special thank you to the Vitas Hospice Program and the healthcare team that so generously dedicated their caring touch and support to Jim and his family. The peace and comfort they provided will never be forgotten. "Email Address" would like to share the life celebration of James H Johnson, Jr.. Click on the "link" to go to share a favorite memory or leave a condolence message for the family.